Richard Garriot officialy announced support to my petition. Together we can drag NCsoft to open and face them with truth. The truth is that people all around the world are WILLING and WANTING to play this game. With Your help I can get those votes I need. Together we will suceed , I ask for Your support. Together we can revive this game. This game deserves to be one F2P even if it is long dead it still far away from being forgoten - something legendary cannot die, it can only lay dormant. On February 28, 2009, Tabula Rasa will be shutting down its servers, and as of January 10, 2009, the game will be free to play. Deployment 13 is on Live! It features the new Crafting System, our Series 3 Laser Pistols, purchasable tabs for your AFS Footlocker, the new map and radar style, and much much more. But see for yourselves below! Starr Long, the Producer of Tabula Rasa� at NCsoft� North America, talks about the newest changes to�the game with Deployment 11 and the impact of Operation Immortality�. PvP Singles Tournament on May 24th - All Levels Invited! In correlation with DEV Critters, Warlords of Exodus is hosting a live event for all levels to participate! The event is to take place at the Geodesic sphere at Retread City in the Marshes. 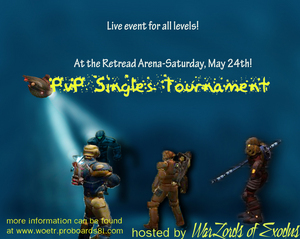 We will be having a PvP Singles event for all levels. We will be matching opponents by their level and profession to avoid our players from fighting classes in their own skill tree. This system will provide a diverse matching schedule, and also allow all levels to fight their own caliber as long as possible. We want to encourage PvP in a productive manor to make our patrons return for our next event! Since all the levels are involved in the same category, the level 50s will eventually prevail, but our clan will be observing the heavy hitters from each class with specially crafted purple items, and other forms of GM loot!. So even if you�re not the top dog, there�s something to be found here for everyone! There is not a formal sign up at the moment, just plan to show up and we'll be there. If you have any questions or concerns, feel free to post on the Official PvP Singles Tournament Thread. 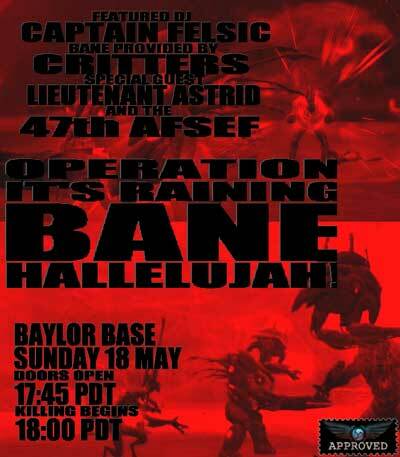 after wave of high-level Bane troops to test your mettle! Abilities & Crafting DB sections have been both updated.